Images Courtesy of Dallas Historical Society. Dallas was settled in close proximity to the Trinity River as trade and commerce were primary motivating factors behind establishing the city close to a body of water. The disadvantage was that the river was prone to flooding, especially during severe rainstorms. Major Dallas floods took place in 1844, 1866, 1871, and 1890. However, the worst flood in Dallas history was in May of 1908, when the Trinity rose to 52.6 feet and where five people perished, 4000 more were displaced and thousands of cattle drowned in the disastrous overflow. In addition, essential utility and communication services were disrupted and downtown bridges and train lines were flooded, preventing transportation between the downtown business sector and Oak Cliff. Although property loss reached $2.5 million, an astronomic amount at the time, the 1908 flood had another significant historic repercussion for Dallas. As the Dallas community experienced an unexpected economic and population boom in the late 19th and early 20th centuries, city leaders wrestled with how to structure the municipality into a hub of commerce and an economic, cultural and political center. 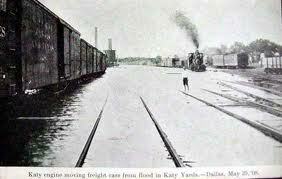 However, the historic 1908 Dallas flood provided a decisive impetus to devising a managed growth plan for the city. In fact, the devastating flood put an end to a decade old debate about reining in and containing the haphazard growth and outward extension of the municipality. A multifaceted city plan had to be devised. To restrain the Trinity and curb the potentially catastrophic consequences of flooding, as well as draft a long-term improvement plan for Dallas, city leaders hired the German-born George Kessler, a city planner who earlier designed Fair Park. Kessler devised a comprehensive, far-reaching proposal, including building a levee system to redirect the Trinity River, centralizing train terminals, opening up and broadening various narrow downtown streets, developing city parks and constructing Central Expressway. Although not all the elements of the Kessler Plan were actualized immediately, many were seen as important and beneficial and were eventually put in place, to the great advantage of Dallas and its residents. Dalworth Restoration has been helping residents in the Dallas area with flooding since 1976. If your home or business gets flooded during a natural disaster or every day disaster such as plumbing leaks, contact the local Dallas water damage restoration company.